Marc Gasol is synonymous with effort, perseverance and sacrifice. The absorption of these values has helped him to become an elite athlete and, on his own merits, one of the greatest interior NBA players in recent years. Along with these values internalized through sports, Marc has learned within family the importance of healthy habits. Just like his older brother Pau, he vividly remembers that his knowledge of healthy habits began at home, particularly with his parents. 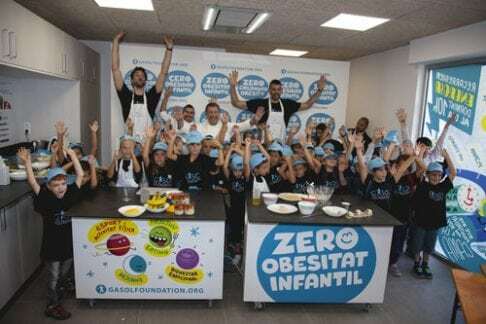 Ever since the Gasol brothers founded the Gasol Foundation in 2013, their mission has always been the same: to promote healthy habits and curb the growing epidemic of childhood obesity. In order to accomplish this, the foundation emphasizes its 4 pillars of healthy habits, which consists of a healthy diet complemented by an active lifestyle, a routine of quality rest, and emotional well-being. These pillars support all actions of the Gasol Foundation. “I am very happy to be able to join forces with my brother Pau with this very personal project. We want children and their families to discover that a healthy life is not just possible, but even simple and fun. The foundation is expanding the scope of its programs and activities because we want to position ourselves as an entity of national and global reference in the fight against childhood obesity, and help to avoid the problems that derive from it “, Marc explained. The Gasol Foundation also has Marc as a spokesperson for its healthy initiatives. Among other initiatives and projects with his brother Pau, Marc is the protagonist of the series “The Healthy Galaxy”, an educational web production. Under the motto “Make It Healthy Make It Fun”, the series proposes a familiar and playful approach to inculcate healthy habits to young children. In it, children explore the Healthy Galaxy and visit the planets of Nutrition, Physical Activity, Sleep, and Emotional WellBeing. The same Gasol Foundation messages are conveyed, but in a manner in which young children can enjoy and thoroughly understand. The Gasol’s are extremely proud of all they have accomplished thus far within the foundation, but they realize there is much more work to be done. The continued support of individuals, families, communities and organizations is still greatly needed to make an even greater impact on childhood obesity rates and children’s overall health.